Procon Technology has searched all over for these value-for-money desk-top power supplies. Please see prices below and email us regarding your quantity requirements or special application. Units with fixed voltage and variable voltage and current are available as well as linear laboratory power supplies (some with dual tracking). In Australia, call 03-98306288 now to buy! All Manson power supplies have a 12 months warranty. Now available is the programmable HCS3600-USB series with 16V/60A, 32V/30A or 60V/15A output and USB port control for QC testing, battery charging and simulation, control applications including research and product development. Can also be used for speed control of DC motors and in applications as diverse as electroplating, pulse electrodeposition (PED), crystal growth and thermal analysis! Use the HCS computer programme provided on CDROM to sequence through 20 voltage/current operations whilst logging the output voltage and current data or write your own software (for Windows, Linux or Mac OSX) or use third-party software such as LabView for unlimited steps and completely automated applications! Source-code example programs provided in VisualBASIC and VBA (Visual Basic for Applications) for Microsoft Excel and Word. See the HCS Command Set. Also available, with USB ports, are the HCS3300 series with 16V/30A or 32V/15A output and the HCS3100 series with 36V/5A or 60V/2.5A output. The HCS3400-USB power supply 16V/40A is now in stock! NEW! Firmware version 3.1 and above now has isolated USB ports and enhanced command set with calibration mode. Also iPad and Android Apps are now available for control of your HCS-USB power supply using Raspberry Pi via WiFi! The NEW state-of-the-art 'Manson' HCS3600 series provides a true high-current laboratory power supply with many advanced features including; small size (200x90x275mm) and weight (3.5Kg), a quiet fan with speed control, rotary encoder voltage and current controls with course and fine adjustment, three user defined presets (P1, P2, P3) , remote control of voltage and current (0-5V or pot) and a remote on/off control. Most significantly, it provides automatic cross-over between constant voltage (CV) and constant current (CC) modes with LED indication! The HCS3600 model provides 1 to 16VDC at 60A and has remote voltage sensing capability (to compensate for voltage drop in cables). The HCS3602 provides 1 to 32VDC at 30A and the HCS3604 provides 1 to 60VDC at 15A. Current overload (OLP), over temperature (OTP) and over voltage protection (OVP) are provided. All HCS power supplies come with an 'Electrical Performance Test Report' to certify that the unit has passed all test parameters. This state-of-the-art power supply has many servicing, research, education, laboratory and industrial applications in many diverse fields such as telecommunications and railway workshops. With microprocessor control it features an advanced power-on test sequence, fine and course voltage and current adjustment, tracking Over Voltage Protection (OVP) and is capable of setting the current limit with no load or short-circuit required! Also available are the HCS3300 and the HCS3400 series. For the electroplating industry we now offer the AHR Range. The 'Manson' SPS9600 (M8222, Q1775, SPS-1560, 1693) model provides 1V to 15VDC at 60A (66A max) current-limited output! Features digital meters, remote voltage sensing and a remote voltage control input using 0-5 volts or a 5K potentiometer - with remote on/off control - ideal for automated testing (remote shutdown or programmed voltages) or selecting a fixed voltage e.g. 13.8V. OLP, OTP and OVP provided. Dimensions 220x110x360mm + 35mm for rear terminals (8.7x4.3x14.2") and weighs 5Kg (11lb) or 5.6Kg (12.4lb) in box. Specifications: Load regulation: 0.1% + 5mV, Line regulation: 0.05% + 3mV, Ripple: 15mV RMS (40mV p-p), Efficiency: >85%, Active PFC: >0.95 This power supply can be used for testing, repairing and running 12V/13.8V equipment such as automotive headlights, inverters, motors etc. And for battery charging. We fit a trim pot into the remote plug providing a preset 13.8VDC output when 'remote control' (on the rear) is switched ON. 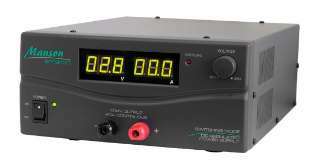 The SPS-9602 model with 1-30V 30A output is now stocked with a preset of 27.6V. 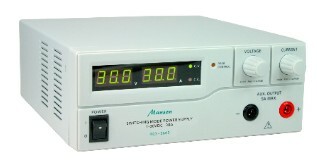 The SPS9400 (MP-3090) 'Manson', 'DOSS' or 'Electro' laboratory or bench top power supply provides a high current output in a light weight package at a reasonable price. The switch-mode power supply provides regulated 3V to 15VDC 40A output. Dimensions 220x110x300mm (8.7x4.3x11.8") and weighs 3.5Kg (7.7lb) Specifications: Load regulation (0-20A): 200mV, Line regulation: 50mV, Ripple: 50mV p-p, Efficiency: >78%, Active PFC: >0.95 Features digital voltage and current meters, voltage adjustment, 2 screw terminals (+'ve and -'ve) which accept 4mm banana plugs. This model can be used to charge 12 Volt batteries and for powering 13.8V systems. The unit can be fixed at 13.8V by a recessed switch underneath the power supply. The SPS-8400 model with analogue meters is no longer stocked, we recommend the SPS-9400 or the HCS3400 model. The SPS-9402 model (or Q1765) with 3-30V 20A output is no longer stocked, we recommend the HCS3402 model. The SPS-9250 model with 3-15V 25A output is no longer stocked, we recommend the HCS-3300 model or, if you require a fixed 13.8V, we recommend the SPA-8330 model. This 'Manson' SPA8230 model provides a fixed 13.8V (adjustable trimpot 12-15V) switch-mode power supply features light weight construction (1.6Kg) and a small size (181x63x190mm) for it's 23 Amp output capability (25A peak). Use it for operating 12VDC car equipment such as car radios, CD-players and CB radios etc. Amateur radio transceivers and 12V battery charger in caravans, yachts etc. This unit provides an auto accessory socket and screw terminal outputs which also accept 4mm bannana plugs. Operates on 240VAC (110VAC optional) 50-60Hz and comes with manual, IEC mains lead and underbench mounting brackets. The 'Manson' SPA-8330 model provides a fixed 13.8V (adjustable trimpot 9-15V) switch-mode power supply provides a 33A output capability (36A peak). The SPA-8330 operates on 100-240VAC, measures 200x80x213mm and weighs 2.7Kg. For more information - click here. This unit is recommended for use where low ripple and noise is required, such as powering Radio Equipment. It uses the latest technology and provides extra protection against overload and over temperature situations! Compared to the SPA8230 it offers higher peak output, better line and load regulation, higher temperature operation, higher efficiency and active Power Factor Correction. The 'Manson' SPS9620 switch-mode power supply provides a fixed 13.8VDC (adjustable trimpot 11-14V) with 120A current-limited output! It provides a maximum of 1700 Watts of power! It features remote voltage sensing, dual thermal-controlled cooling fans and active PFC. Dimensions 235x218x345mm + 35mm for rear terminals and weighs 11Kg (24lb). Specifications: Load regulation: 0.1% + 5mV. Line regulation: 0.05% + 3mV. Ripple: 15mV rms (40mV p-p). Efficiency: >85%. Great for 12V battery charging and automotive or amateur radio use - as used by car dealerships to power showroom vehicles! e.g. Land Rover and Jaguar. And used for car hi-fi demonstration displays! NEW version now available with reinforced internal structure for extra safety and reliability! HCS-3400-USB, Lab P.Supply 1-16V at 40A... Now in stock! HCS-3602-USB, Lab P.Supply 32V at 30A... Available soon! HCS-3604-USB, Lab P.Supply 60V at 15A... Available soon! P-0413, Test lead kit with probes, croc. clips & bananna plugs! $10.00 $11.00 . SM = Switch-mode operation (compact and light weight). All SM power supplies have regulated outputs and operate on 220-240VAC, 50 or 60Hz (some supplies operate from 100VAC to 240VAC). 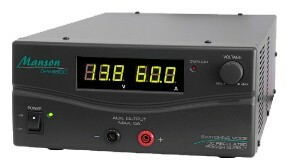 All "Lab" (laboratory) power supplies have voltage and current meters. 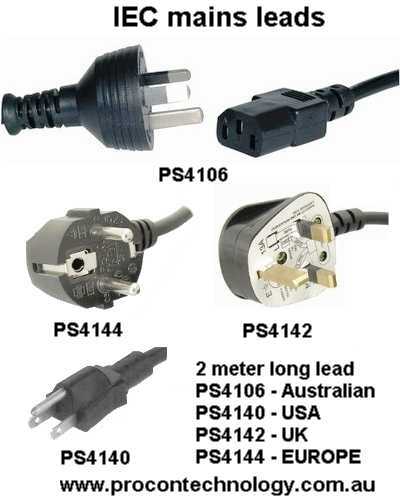 Click here to go to MeanWell Mains Power Adapters. Delivery charge within Australia $11 for < 500g, $16.50 for HCS, SPA supplies (all except SPS). For SPS/AHR units - P.O.A. (ask us). Delivery to overseas destinations P.O.A (ask us). EX-GST purchases may only be made when the delivery address is outside of Australia. i.e. for EXPORT orders. Prices subject to change without notice. The HCS-3600AHR series replaces the SPS5600 series used for electroplating or in the electrochemical or metal finishing industry (including electrocleaning, electropolishing and electromarking). These special power supplies or rectifiers can be used for Industrial or Scientific purposes and have a 6 digit Amp Hour Meter and reverse polarity switch with OFF position. Three models are available; HCS-3600AHR: 1-16V, 0-60A unit, HCS-3602AHR: 1-32V 0-30A unit and the HCS-3604AHR: 1-60V 0-15A unit. On all models, both the Voltage and the Current limits can be set. Click here for more information. These power supplies are used for brush-plating (or selective or swab-plating), portable electro-plating and electro-chemical metalizing. For Anodising and Plating Kits for bronze, cadium, chromium, cobalt, copper, gold, lead, nickel, silver and tin... see www.dalic.com.au For video showing brushplating - click here and "The Art of Brush Plating" - click here. Applications include... aerospace, aircraft, manufacturing, marine, military, power, railway and transport industries and many others! Our unit was designed for use by the Australian Aircraft Maintenance industry. CASESTUDY - Brush Plating for the 21st Century (a Dalic feature article) - click here. Power Supply operational tips: 1. Carefully check the voltage of your appliance before connecting and DO NOT switch on until you have checked the following: (a) Check current requirement (the power supply should always have more current output than the device requires). (b) check the connection required (e.g. the plug type) and (c) the polarity. i.e. positive or negative connections. 2. With the high-current HCS, SPA, SPS and SSP power supplies we have been advised that, if drawing more than 10 Amps continuously, you should ensure that proper lugs are used and the terminals are tightened securely. If operating continuously at high current we recommend using the HCS3600 or SPS9600 60A supply which have large or gold-plated terminals at the rear and remote sensing that compensations for the voltage drop in cables! 3. All Manson switch-mode power supplies have proven to be very reliable and NONE have been returned faulty under warranty in the last 10 years. All come with 12 months warranty. Manson engineers say that the biggest problem they have with a power supply failing is with people trying to charge batteries and connecting them with reverse polarity! Please TAKE CARE and ask us for instructions. 4. The SPS8400 and SPS9400 have an internal variable resistor that can be adjusted for a fixed output between 11 and 16 Volts (factory set to 13.8V). Please ask for further information and ensure that only qualified personnel are allowed to open these power supplies (extremely dangerous voltages inside). 5. All power supplies can now be used in series for higher voltage (the terminals are floating or isolated) provided that an external diode is used to protect the supply from reverse voltages! NOTE old versions of the SPS9400 were negative earthed! 6. Another application for the SPA8330 power supply is to replace a 12V car battery when recharging lithium-ion or polymer battery packs and NiMH battery packs as these chargers require high current. Obviously up to ten (more with the HCS3600 or SPS9600) such chargers could be connected to the one supply. Take note, model car, aeroplane or helicopter enthusiasts and clubs! 7. The SPS9620 power supply provides 13.8V at 120A and is ideal for high-power car audio demonstrations and showroom cars - as recommended by Mark Richards of Jaguar Land Rover Australia. Manson reliability: All Manson power supplies come with a 12 months warranty on parts and labour. They have proven to be extremely reliable units as the last customer's warranty claim occurred 10 years ago! Manson are a Hong Kong based company that oversees manufacturing in their Dong Guan factory in China. They are well constructed and conform to international standards of construction and safety. Manson are an ISO9001 certified manufacturer with research facility. They also have QC080000 or "Green Manufacturing" Certification and have implemented a Hazardous Substance Process Management (HSPM) system. In addition Manson Engineering now recycle power from "burn-in" tests back to the mains, reducing waste heat and the air-conditioning bill! For the "Company Responsibility Statement" - click here. Disclaimer: The above specifications are subject to change without notice. Please ensure the suitability of these products for your application before purchase. Colour and design may vary to that shown.